The Rangers are now in their post-deadline days, and with the trades of Mats Zuccarello, Kevin Hayes, and Adam McQuaid, have entered full tank mode. The trade deadline saw the removal of two of their best four forwards, and the only NHL body that comes to the Rangers is Brendan Lemieux. Suffice it to say, that’s a significant downgrade on the current on ice product. Helping matters along is the Tampa Bay Lightning coming to town. The clear cream of the crop, the Bolts are basically Stanley Cup or bust this season. For the Rangers, this bodes well as a Cup means they get Tampa’s 1st rounder (31st) instead of their 2nd rounder (likely 58-61). That’s a big jump. Andrei Vasilevsky gets the start. Crazy Prediction: Lemieux scores in his first game. 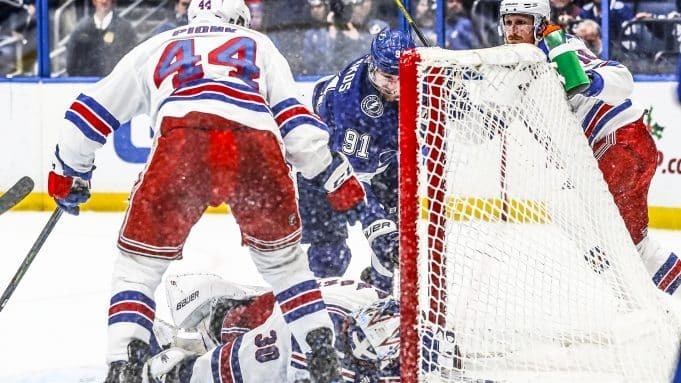 All I want is a competitive game, win or lose………..
Don’t like sitting Chytil and Smith up on the wing , makes no sense! Quinn tried Chytil on the 4th line….he stinks there. From what I’m seeing, we’re showing a lot of fight and playing with a high compete level. Feels like we’re developing a new culture ’round these parts, I’m optimistic with our direction. Yes your right, Fast belongs on the 4th not Chytil. And so it begins…the youth movement. Let’s go Rangers! As soon as he learns to compete hard on every shift in every zone, he will not sit again. That’s what a youth movement is, a learning process. 20 games left , you make him learn the hard way. Playing Chytil on the 4th is like playing your goalie on defense. That will teach him a lesson. Bang on Joe. You gotta compete to earn your spot on the squad. Jimmy Vesey beats Hedman to the loose puck. Using his body to shield the puck and scores on one of the hottest goalies in the league. Priceless. Where are all the Vesey haters? Pick plays are seldom called…but nonetheless a great hockey. Thank-you David Quinn and his New York Rangers for the entertainment. The first was ugly. Glad they turned it around and played hard the rest of the way. Have to make PP’s count. Every game he tries to tank. Look at his lineup. 7 D. Put Fast on the line with talent and they don’t score. He definitely is not trying to win but wants people to play hard. Handcuff the lineup but play hard. That is why they come close but don’t win or stay average. If that thought was not genius, nothing is!